When I saw the Kobocha squash at Imwalle Gardens I knew that the Kobocha Squash Bread Pudding was in our baking future. After two separate trips to the farm I collected enough of the winter squash to do it justice. You will need one of the dusty green squash on the larger size 3-4 pounds, to roast for the orange sweet flesh and then a few miniature ones to cut in half and serve the bread pudding inside. It really is a show stopping presentation. When I served this more than a decade ago, table side at Boxer Restaurant in Los Angeles, we would serve it with a Cider Sage Reduction, Persimmon Coulis and a smoking cinnamon stick, lit and blown out right before entering the dining room. Imwalle Gardens sells a mix of conventional and organic produce, as well as many fruits, vegetables, flowers and plant starts that they grow at the farm. If you have the opportunity to visit during this Autumn season you are in for a real treat. 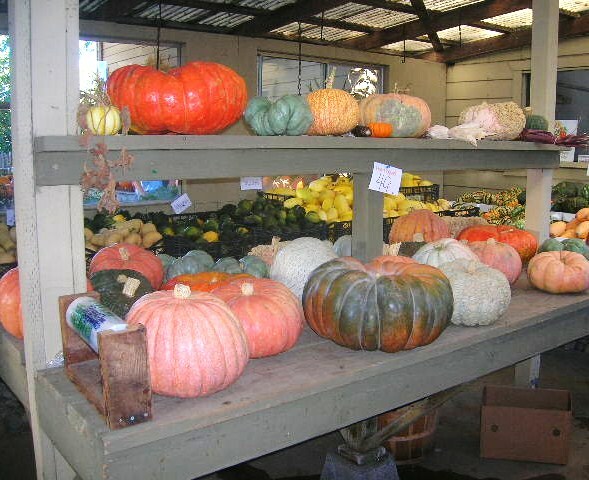 The extensive display of pumpkins, gourds, and winter squash is a virtual harvest festival all on its own. The Imwalle family have a long tradition of farming in Santa Rosa. Three generations ago, Joseph J. Imwalle started the family farm in 1886. Joseph J. was good friends with Luther Burbank, and worked with him on many projects. He is also credited with developing the Pink Lotus and Tuberous Rooted Begonias. At the height of the farm it reached 144 acres, Imwalle amassed this over time, little by little. This farm also has survived a lot of change and city development. When Highway 12 was built it cut their farm right in half, mowed down acre after acre of beautiful prune orchards and was directly next to their farmstead home. This was a hard blow to the Imwalle farm…but did they give up goodness no…they keep moving along and working their farm. This farm is a product of history and the “lone survivor ” of the old-style truck garden. Kobocha is a winter squash that is Japanese in heritage. You can roast it in a similar cooking process as the Sugar Pumpkin. When cooked you can easily scoop out and puree the reddish yellow sweet flesh in a food processor. This puree can be used in any recipe that calls for canned pumpkin. Kobocha are very hard and slicing in half at the equator may be a little difficult and dangerous, due to the possibility of the knife slipping. So what I tried out was roasting the squash whole and it worked like a charm. Wash and dry the outside. Place on a baking sheet. Preheat oven to 400 degrees. Roast for 40 – 50 minutes until a knife slides in with no resistance. Preheat oven to 400 degrees F. Wash and dry Kobocha squash. Place all squash, whole on a baking sheet. The large 3 -4 pound squash will take approximately 40 – 50 minutes to cook. The smaller squash cook in about 20 -30minutes. Keep checking and remove smaller squash as they become tender when pierced with a knife. Remove from oven and let cool. When cool, slice large squash in half. Remove the seeds and puree in a food processor. 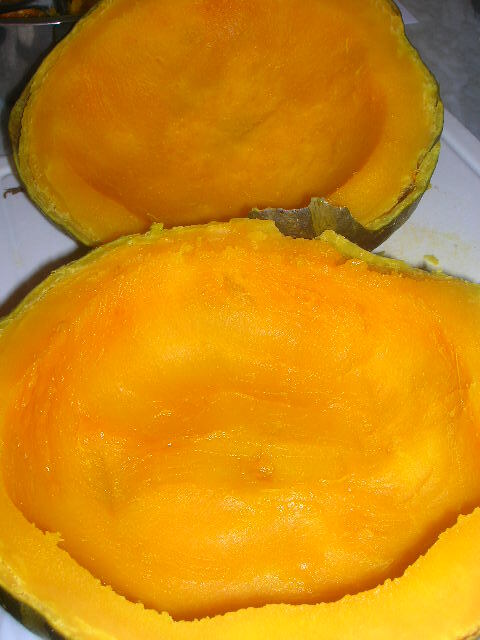 Small squash can be sliced in half, the seeds removed and reserved covered, to keep moist until ready to serve. These will be the squash that the bread pudding is served inside. Combine Kobocha squash puree, milk, heavy cream, molasses, brown sugar, sugar, eggs, spices, vanilla and salt in a large bowl. Add cubed French bread to the mixture, stir to moisten all the bread. Cover and refrigerate for at least 2 hours to overnight. Can be prepared a day ahead. Meanwhile place the spiced cider in a saucepan and place on stove over medium to low heat. Slowly reduce until you have about 1 cup of liquid left. Remove from stove and let cool. The cider reduction will thicken almost to the consistency of syrup. Set aside. Preheat oven to 350 degrees F. Butter a 9 x 11 baking dish. Pour mixture into dish. Sprinkle with turbinado sugar and dots of butter. Cover baking dish with foil and bake 30 minutes. Remove cover and bake for another 15 to 20 minutes until brown and crispy. At serving time the small squash can be reheated for 5 minutes in the oven at 325 degrees F. Remove from oven. Place the bottom half of one of the small squash on a plate. Place a scoop of bread pudding inside the squash. Replace the top side of squash on top of the bread pudding, allowing the pudding to peek out. Drizzle the squash, pudding and the plate with the Spiced Cider Reduction. Can be served with a dollop of whipped cream, if desired. Any way you choose to serve this, in a roasted mini squash, in a bowl, or straight out of the baking dish; this is the ultimate comfort food with a seasonal twist.